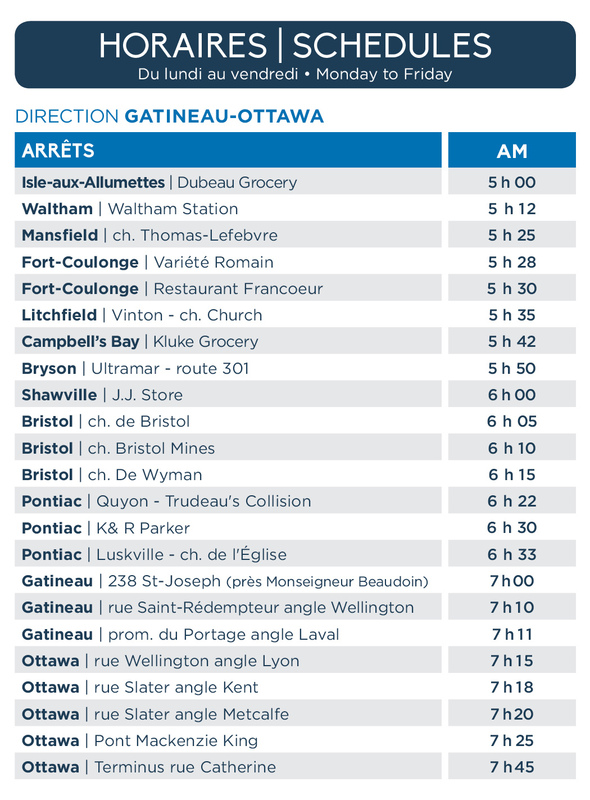 Pontiac-Ottawa Printable Schedule – Follow Transcollines on Facebook. Cheque or cash only. You must provide the exact amount for your ticket. No change will be given. Passengers can purchase daily, weekly, or monthly passes on the bus or, starting in mid-January, at the MRC Pontiac office in Campbell’s Bay. For more information call 1-866-310-1114. The MRC Pontiac and the Municipality of Pontiac have partnered to ensure weekday bus service from L’Isle-aux-Allumettes to Ottawa via their service providers, Transcollines and Campeau Bus Lines. Passengers can now travel in style on a brand new bus equipped with sofa, wireless Internet and plasma screens at the same 2016 fares. For the moment, the 2016 schedule remains unchanged, but the partners are exploring the possibility of increasing the frequency of service. The retention of bus service along Highway 148 West was made possible through the financial contribution of the MRC Pontiac ($29,500), the Municipality of Pontiac ($13,125), and the Quebec Department of Transport’s Green Fund ($127,875).